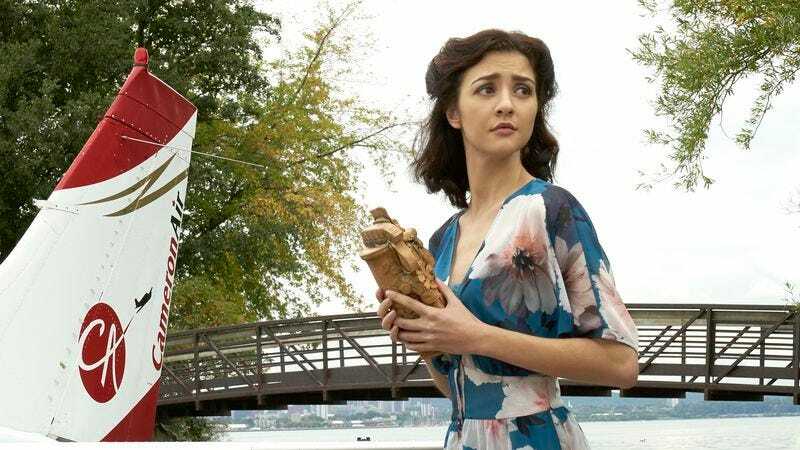 Time marches in a mostly linear fashion on Man Seeking Woman, though the concept maintains the same elasticity as reality on this show. Where else could a teenager spring forward fully grown, like some kind of toilet Athena? So even though Josh and Lucy’s decision to move in together in the premiere was impetuous, it also felt somewhat deliberate, because as is so often the case on MSW, so many things were happening (or being ignored) at once. A 14-hour Ken Burns documentary would sound like a prison sentence to some, but here it’s just a lazy Saturday spent with your significant other. The markers for time’s progression aren’t always obvious, but “Pad Thai” opens with a pronouncement that Josh and Lucy have now been together for about a year. Since then, they’ve gone from starry-eyed lovebirds to spring roll-scarfing roommates. Well, things aren’t quite that dire, but they are bad enough that the couple now serves as a cautionary tale. They’ve become the neighborhood boogeyman/woman, who indiscriminately watch whatever they can stream because it sure beats doing stuff. Binge watching is the only thing that Josh and Lucy seem to be up for these days—that, and ordering lots of takeout, including the titular “Pad Thai.” Oh, and practicing good skin care (I’m pretty sure that was a Bioré strip on Josh’s nose). The passion that prompted them to make such a significant commitment so early on has congealed, leaving them only able to move to and from the couch. Their single days are now in the past, where Josh is happy to leave them. Lucy, on the other hand, recalls her late nights with friends a little more fondly, which is how her old roommates (the former anti-Josh bloc) lure her into one last heist. I mean, outing. But you can see how I’d get confused. It must have been hard to see it underneath the pile of Thai takeout boxes, but Lucy’s feeling restless. That becomes obvious when she jumps at the opportunity to go dancing with her friends (to K-Ci & JoJo, no less). Lucy’s also been in denial about feeling dissatisfied with her relationship. There’s also probably some guilt at (briefly) wanting something more, or rather, something else. These doubts and emotions get the fantasy sequence treatment, via an Ocean’s 11 homage and Indiana Jones-style escapade, complete with gentleman adventurer who dabbles in supernatural antiquities. They’re funny and well executed (seriously, did FXX just get around to throwing money at this season? Did Mike O’Brien pitch in? ), though The Sandlot one at the opening probably hit me hardest because I love that movie. But Lucy’s fears stand out among the flash and humor because they feel very real and very recognizable. The truth is, Lucy and Josh have grown complacent in their relationship. It’s a common enough problem. Lucy is the first one to realize this, but she’s not the only one. The problem is, she might lack the confidence in their relationship to bring it up to Josh for discussion. Or maybe she just misses the flutter of excitement over meeting someone new. Once again, Katie Findlay is given a chance to stretch, playing a gorgeous gal with soda-can curls, ready to be whisked away. But she’s also the steely-eyed dating vet, who’s only got enough left in her for one more look at what she’s given up. As we saw in “Popcorn,” though, her fantasy ultimately proves less appealing that the one she’s already living. It’s remarkable that we’ve seen so much growth in a character we met just this season, which is a testament to the writers and cast. Jay Baruchel has such great chemistry with his co-lead that this reset is a unique achievement for this show (or any other, really). This season has definitely been more Lucy-centric than anything, but I don’t think Josh has been neglected in his character development. We learn that he shares many of the same concerns as Lucy; it’s just that these days, he’s not always going to be the one to freak out about them. Whether it’s evolved into one—or just become more defined—Man Seeking Woman is a relationship comedy, and a great one at that. Because I’ve felt proprietary ever since I first started watching the show, I have to admit I’m proud of how far the team on and off screen has come. “Pad Thai” was written by Cirocco Dunlap, and directed by Rachel Goldenberg (who helmed the premiere). Let’s add Shoes: The Sole Of The People to Man Seeking Woman’s list of alternate Hollywood productions. It’s good to know that shoes will remain roughly the size of feet. How do we feel about a web series of just Josh and Lucy’s grand adventures? They could learn lessons about greed and the other vices. I’m sorry about the delay! I have had a week, you guys.